If you were asked to identify one question that you have asked the most over the course of your life, what would that question be? For me that question would be ‘why?’. This question got me into the most trouble as a kid…and as a teenager, giving me the reputation in our family as being challenging and rebellious. In fact, it wasn’t until I hit my 40s that my parents finally realized that I wasn’t rebelling but truly wanted to know ‘why’; what was the purpose of doing the things I was asked to do. Just had to know why! Let me give you an example of some of the questions I’m currently asking regarding my business students. Why do some students choose to come to class only when it’s convenient? Why do so many students struggle with thinking critically? Why do so many students leave college still not knowing what they want to do with their life? How do we motivate students to choose to come to class even when it’s inconvenient? How do we encourage students to think critically? How do we change the question from ‘will this be on the test?’ to how will I use this in my life and career? How do we help students discover their passion, their personal ‘why?’ in order to enter careers they will enjoy? How do we motivate employees to be more engaged…to take more ownership? How do we create environments that encourage critical thinking? How do we help employees connect what they do at work with why they do it? How do we help employees realize their greatest contribution? Author Daniel Pink believes it has a lot to do with autonomy; you may want to get your hands on his book ‘Drive’. Lots of ‘hmmm moments’ to probe and ponder. This entry was posted in Uncategorized and tagged learn, motivate, why. Climb the steps…open the door! I have just discovered that I have a fascination with steps and doors. 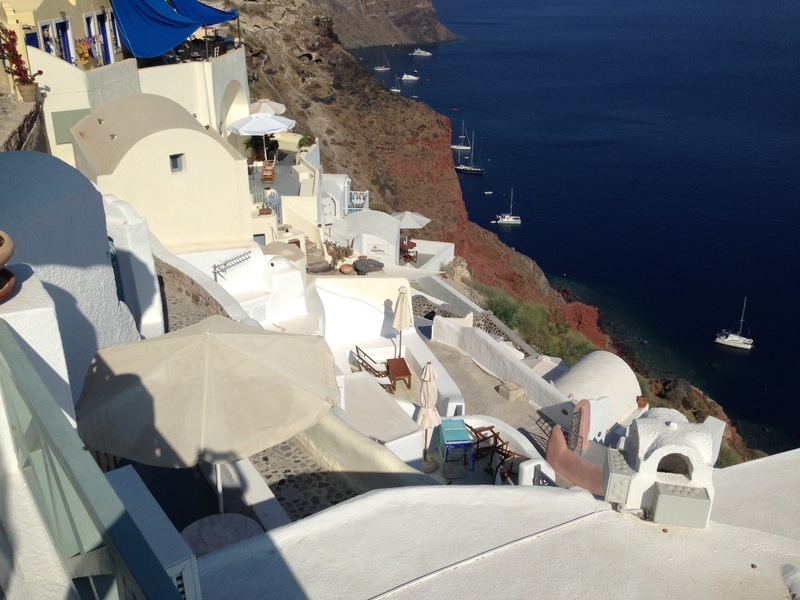 We were looking through vacation pictures from Greece for the purpose of choosing five to print off and create a vacation memory wall…and it hit me! So many of the shots I had were of steps, stairs, and doors! 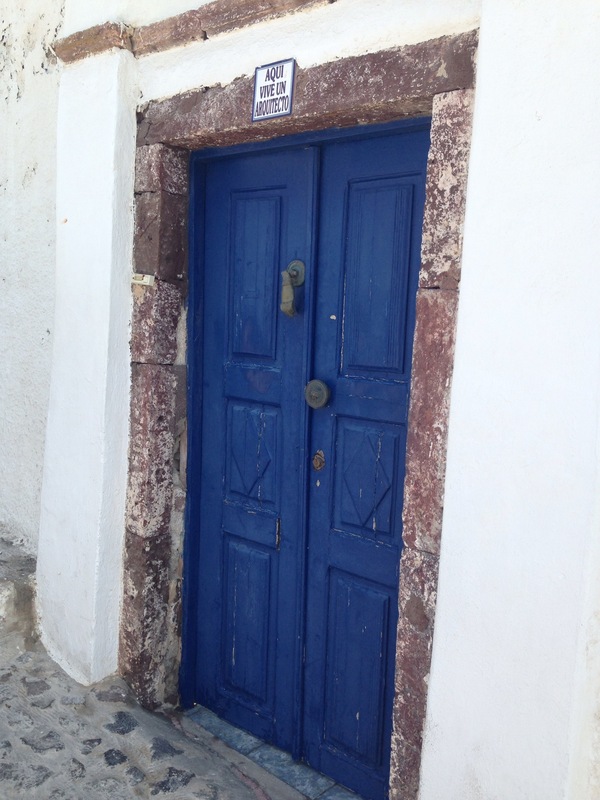 Many of the doors led into private homes…each a different, vibrant colour. 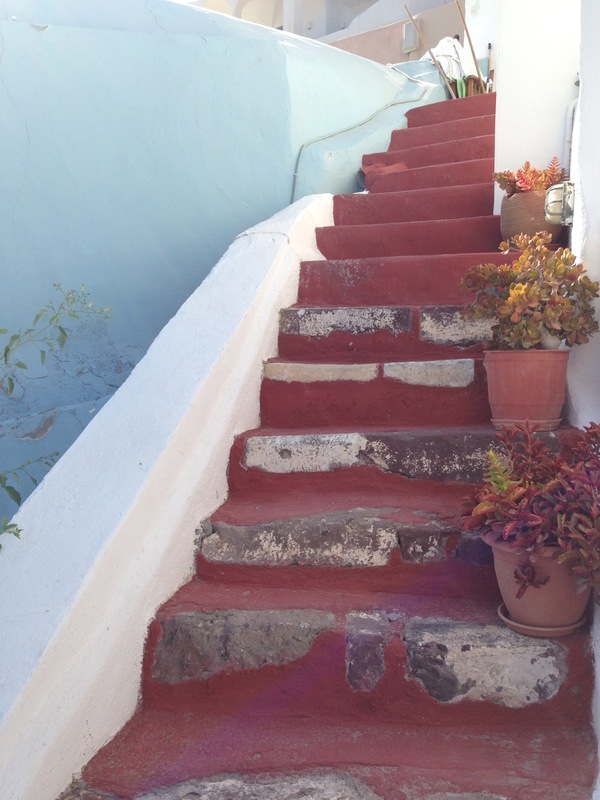 One particular door in Santorini actually let us access the descending steps that led to our vacation cliff home! When we opened the door, not only did we see the red clay winding steps, but we were also treated to the most amazing view of the Mediterranean Sea…breathtaking! Perhaps my fascination with doors and steps has something to do with wondering where they lead. You can imagine the frustration when I came across locked doors, blocked steps, and ‘do not enter’ signs! 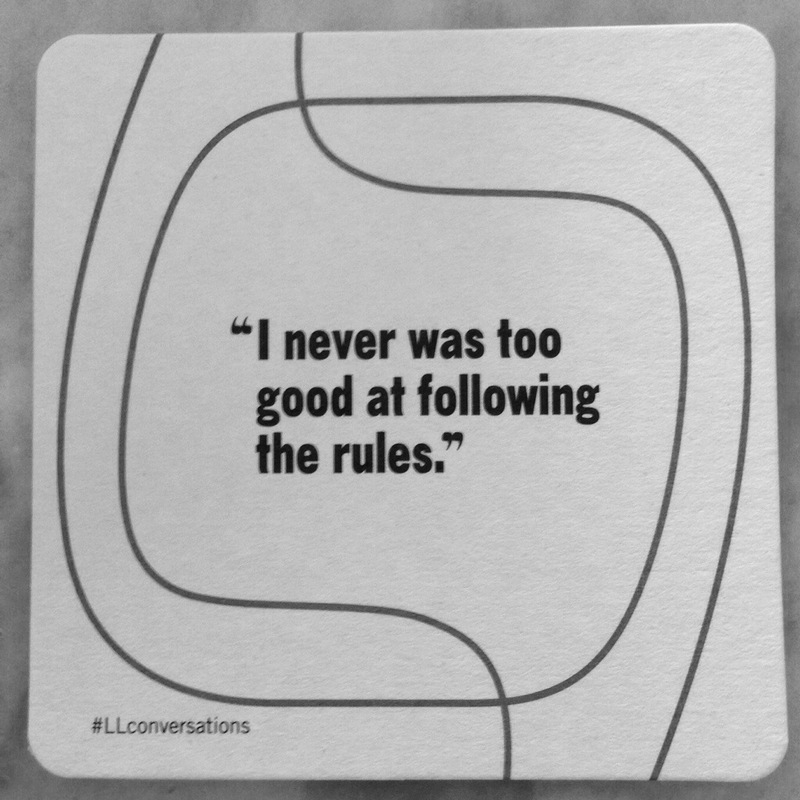 Does this reflect some of our approaches to training and development? Maybe. I think it starts with our kids. We want them to grow, to be curious, to explore, to learn, but then hear ourselves say things like ‘don’t touch’, or ‘just do as I say’, or ‘hurry up!’. Moving on to formal education and the structure set in place that dictates the how and when of learning; Sir Ken Robinson has much to say on that front! Check out his blog at http://www.sirkenrobinson.com . Are we allowing time for exploration born out of curiosity, or do textbooks dictate the schedule and content? Then we finally get the job. On the website we have read that the organization we have joined not only supports and encourages training and development, but places a high value on employees taking initiate for their own growth. Up the steps, hand on the doorknob, but it’s locked…this stated value is just that, stated, not actual. In fact you eventually discover that the first budget line to be cut when difficult times hit is professional development. So what do you do? Throw your hands up and give up? Not a chance…you take responsibility for your own development. It doesn’t have to come with a big price tag…be creative in your search for learning. Find a mentor, read a book, subscribe to the blog of someone who is a few steps ahead of you in their career, participate in webinars, and if the budget allows…continue your formal education. Another way to develop? Mentor someone…it’s amazing how much you learn when you are building into someone else. Next time you see an interesting door, or a staircase that leads to ….? Go through it, climb it, see what’s there, take time to probe and ponder what you find. This entry was posted in Uncategorized and tagged challenge, develop, discover, explore, opportunity, train. This idea of learning and developing took on a new meaning to me when visiting Il Duomo di Firenze in Florence. Do you know that they built the cathedral with the skills they currently had, but counted on the development of new skills to complete the dome? That’s what I call blue sky thinking! And…history proves their optimism paid off, the result is breathtaking! That’s what this blog is all about…looking back on what I have learned from past experiences, reflecting on what I am learning today, and challenging my mind as I prepare for the possibilities of tomorrow. I hope you’ll join me in the exploration. This entry was posted in Uncategorized and tagged development, learning, Training.